Handmade Detroit | Project Crawl: Cork It! I really wanted to say that, but if you haven’t seen Sideways, it’s really not all that funny. All dorkiness aside, I tend to find myself with a lot of loose corks from wine bottles after an intimate gathering with my sophisticated friends. Or when I just really have a hankering for cheese and crackers avec wine. I knew I wouldn’t have to look too hard to find useful project ideas. Wine blogs are popping up all over as lovers of the boozey grape share their thoughts. Lisa Shea’s Wine Intro really knows their stuff. 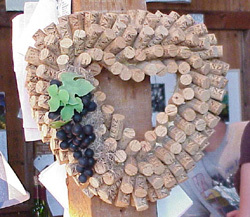 In addition to useful wine knowledge, I found some great craft ideas, too. This tutorial has all the info you’ll need to start working with corks and impress all of your friends at the next neighborhood wine tasting. A Place for Hot Wine? I Think Not! While that idea doesn’t sound too delicious, a trivet made out of old corks does. The instructions couldn’t be easier or quicker to follow. In no time you’ll have a nice accent piece for your kitchen’s hottest pot. We’re almost at the halfway point for Christmas. Start making your ornaments now! Bulletin boards are sooo boring. Well, not really, but they do look better when made out of wine corks. HGTV has the lowdown on how to make you office smell like a distillery. This site has some great reader-submitted suggestions on what to do with corks, such as dart boards, computer stands and even a backsplash for your counter. Now that’s crafty! What is the best way to slice corks without them crumbling? Corks-213-Yes I know i’ve had my email since i was 9 so it’s a child name. But anyway, I dont know what to do with all my corks! If you have an idea for me, please email me at lkcuttie1999@aol.com. Please make the subject cork ideas…THANKS!! Yes ya know i’ve been wondering about hat too.